The Soo Theatre Project announces its summer musical production of Humperdinck’s HÄNSEL and GRETEL. This will be the first full musical production held in the partially re-furbished historic Soo Theatre in downtown Sault Ste. Marie. HÄNSEL and GRETEL is an enchanting and delightful theatrical production for all ages. 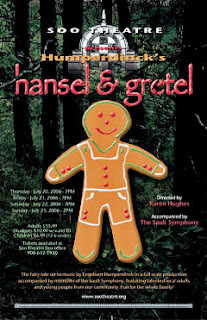 HÄNSEL and GRETEL features local community talent directed by international opera performer, Karen Hughes, and renowned choreographer, Dianna George, with musical accompaniment provided by members of the Sault Symphony Orchestra, under the direction of Dr. John Wilkinson. Cast includes Emily Couling as Hansel, Rachel Mender as Gretel, Maureen Delaney-Lehman as Mother, Jerry Azevedo as Father, Nanette Azevedo as The Witch, Lola Kennedy and Shirley Wilkinson as Sandman, and Lindsey McCullough as Dew Fairy. An array of talented musical and dance performers, both adult and children, complete the cast in the roles of Gingerbread Children and Angels. Come join us for this theatrical delight in an historical setting, July 20-22 at 7 pm, and July 23 at 2 pm. Tickets now available by calling Soo Theatre at 906-632-1930, at the box office, or at the door (as available). Adults tickets are $15, students $10, and under 13, $5.